Kevin Love: Overrated, Underrated, or Properly Rated? Surprise pitching efforts have fueled the Indians, Braves, and Brewers. But how real is that success? And can the Astros ever hope to replicate it? This week is all about surprises. A back-of-the-rotation Brewers starter is unexpectedly tied atop the wins leaderboard; a Braves team seemingly destined for a third consecutive run to the playoffs has hit a huge roadblock; an Indians pitcher has suddenly come out of nowhere to become one of the five best starters in the game; and an Astros team built on the idea of developing premium pitching prospects has suffered unforeseen setbacks that could prompt a change in organizational approach. It’s Week 19 of The 30. Most of the time, our honorees make the cut by flipping their bats in triumph following a long home run. (Or, in Yasiel Puig’s case, following any positive event down to an infield single.) However, some of the most glorious flips happen when a player fails and needs an outlet to properly express his disgust. This week, that player is someone who doesn’t fail all that often: Miguel Cabrera. Facing Brandon McCarthy in the first inning last Monday, Cabrera got a two-strike pitch in the dirt and failed to check his swing. The result was a flawless and rarely seen maneuver: a lift with the left hand followed by a flip-shove with the right that sent Cabrera’s bat flying. We’ll assume that some of the force behind the flip came from an additional speck of frustration over the Tigers’ endless bullpen woes. With their 2014 hopes dashed, these teams are already holding auditions for next year. Though it hasn’t shown in the wins column, the Astros have started to assemble an intriguing collection of position player talent. Second baseman Jose Altuve, a 24-year-old with two All-Star berths already to his name and a possible batting title in his sights, is a franchise player. Outfielder George Springer and DH Chris Carter have developed into one of the most potent power duos in the league, mashing a combined 45 homers, albeit with injury issues for Springer and far too many whiffs for both players. Carlos Correa is out for the year after fracturing his fibula but remains one of the most highly regarded prospects in the minors. And while Jon Singleton is batting below the Mendoza Line in his rookie season, Houston hopes he’ll also become a significant power source and a fixture in the everyday lineup. Unfortunately, the Astros have run into two big disappointments on the pitching side. The fiasco surrounding 2014 no. 1 overall draft pick Brady Aiken cost them a possible top-of-the-rotation starter plus the two other potentially valuable draftees Houston would have been able to sign had Aiken inked a below-slot deal. Meanwhile Mark Appel, the no. 1 overall pick in 2013, struggled terribly in the brutal pitching environment of Single-A Lancaster, posting a 9.74 ERA. The Astros wisely got Appel out of that California desert launching pad and up to Double-A, though not without engendering some criticism from a few disgruntled players, who griped about the promotion and Appel’s invitation to throw a bullpen session at Minute Maid Park. The politics of both incidents aside, the facts remain: The Astros lost out on Aiken, and until they start seeing some results, they can’t know for sure what they have in Appel. Even amid the emergence of Dallas Keuchel and Collin McHugh, the Aiken and Appel situations might force the Astros to rethink their rebuilding philosophy. The first and easiest option is to wait for other pitching prospects to develop and hope that at least a couple make it through the usual gantlet of injuries and adversity. We’re already starting to see the carnage that Mike Foltynewicz can inflict on unsuspecting hitters. • Josh Hader, a 20-year-old lefty who, unlike Appel, put up great numbers at Lancaster (2.70 ERA, 112 strikeouts in 103.1 innings) and who has made it to Double-A himself. • Vincent Velasquez, a 22-year-old right-hander who missed two months this season with a groin injury but remains highly regarded by Astros brass. • Nick Tropeano, a 23-year-old righty who’s considered to have less upside than some of his fellow Houston pitching prospects, but who could be next in line for a call up to the Show. He’s spent all year pitching at Triple-A, where he’s struck out a hair fewer than a batter per inning. • Lance McCullers Jr., a 20-year-old righty with good bloodlines (his dad pitched seven seasons in the majors) who’s whiffed 242 batters in 209.1 minor league innings and ranked as MLB.com’s 52nd-best prospect entering the season. • Michael Feliz, a 21-year-old righty who’s still pitching at Quad Cities in the Midwest League and might need more development time than his fellow Astros prospects, but who has shown big swing-and-miss potential. Waiting for the kids could eventually bear fruit. However, there’s a high attrition rate for pitching prospects, the Astros are on their way to a sixth consecutive losing season (and possibly even their fourth straight with 100 or more losses), owner Jim Crane keeps his money holstered,1 and the team has a glaring need for high-level talent, which means that a more aggressive approach might make better sense. The 2003 Tigers are the blueprint. That year, Detroit fielded one of the worst teams in major league history, losing an unfathomable 119 games. Rather than merely accept the harsh reality of being awful, owner Mike Ilitch and GM Dave Dombrowski began spending money for real talent. In the winter following that 2003 debacle, the Tigers inked quality veterans Ivan Rodriguez and Rondell White to multiyear deals, then made big-ticket acquisitions by signing Kenny Rogers and Magglio Ordonez in 2005. Three years after that ignominious ’03 campaign, Detroit marched to a World Series appearance, led in part by a new generation of young talent that had been given time to develop, but also by that new wave of veteran pickups. Houston will have an opportunity to chart a similar course this offseason. The list of free-agent pitchers this winter will include 2013 Cy Young winner Max Scherzer and fellow aces James Shields and Jon Lester, as well as some intriguing next-tier talent in McCarthy, Francisco Liriano, Josh Beckett, Jorge De La Rosa, and Justin Masterson. Plus, various veteran starting pitchers who are approaching free agency could make for attractive trade candidates, especially if they’d be willing to sign extensions to stay in Houston. While some pockets of the baseball world might already be crowning the Astros the 2017 champs, the reality is that reaching that level is incredibly tough, and trying to do so almost entirely with prospects and the occasional Scott Feldman or Dexter Fowler add-on only exacerbates the degree of difficulty. If the Astros want to make good on their lofty projections, or even come close, they can’t rely entirely on building from within. They’ll need to expedite the process by spending some real money for some real impact players. These teams are unlikely to make the playoffs but still talented enough to make some trouble for others. It’s time to stop calling Corey Kluber a really good pitcher, because that’s a completely unfair and misleading characterization given his ability. Instead, we need to start hyping him as the second-best pitcher in the American League and a legitimate threat to win this year’s Cy Young Award. Based on Kluber’s 2013 superficial stats, there was no reason to expect this 2014 breakout. Though he went 11-5 last year, his 3.85 ERA, 24 starts, and overall reputation as a mid-rotation starter pointed to a pitcher who looked like a poor bet to log 200 innings and become elite. His first few starts of 2014 didn’t scream “dominant,” either: Kluber gave up five runs in just 3.1 innings in his 2014 debut and posted a 5.40 ERA and .337/.370/.505 opponents’ batting line through four starts. Since then, the 28-year-old has posted numbers that rival or beat what any starter other than Clayton Kershaw has done:2 148.1 innings pitched, 168 strikeouts, 30 walks, 114 hits, a 2.00 ERA, and a .211/.259/.306 line against. That run has left Kluber, who’s under team control through 2018, fourth in American League ERA (2.46), third in fielding independent pitching (2.43), second in strikeouts (187), and second in wins above replacement (5.3), trailing only Felix Hernandez. Kluber is first Indians pitcher to have at least 7 double-digit K games in one year since Eckersley (8) in 1976. Kluber’s last four starts in particular have been otherworldly. In 31.1 innings, he has struck out 35 batters, walked just three, allowed just 15 hits, and limited opponents to a .140/.171/.159 line … all while giving up just one earned run allowed, good for a ludicrous 0.29 ERA. Kluber was terrific Saturday while facing the Yankees at Yankee Stadium, a ballpark that’s made mincemeat out of many strong right-handed pitchers. Though the Yanks did an admirable job of running up his pitch count, Kluber still fired six shutout innings, permitting just four hits and one walk. As he’s done all year, Kluber beat his opponent with a combination of his retooled fastball (he now frequently throws two-seamers) and a wipeout curveball; PITCHf/x measures pitch value based on outcomes garnered on at-bats that end with each pitch. By that standard, Kluber’s curve has been the most valuable in baseball this year.3 Sixteen of the 18 outs Kluber recorded came on strikeouts or groundouts, and he induced a total of 16 whiffs on 109 pitches. Saturday’s Kluber-led 3-0 victory, and the 4-1 win that followed on Sunday, came just in the nick of time. The Indians had lost four in a row heading into Saturday and were on the verge of dropping out of the AL wild-card race entirely, especially with the Royals surging. Even after those two wins, Cleveland still sits five games back of K.C. and trails four teams in the battle for the second wild card. And the roster isn’t exactly in prime condition: With Michael Bourn, Nick Swisher, and David Murphy all on the disabled list, Cleveland played Zach Walters, Chris Dickerson, and Ryan Raburn on Sunday, with Walters playing his first game in an Indians uniform after coming over in the Asdrubal Cabrera trade, and playing out of position to boot. With that many injuries, a roster made thinner by the deadline deals that shipped Cabrera and Justin Masterson out of town, and the worst defense in baseball, the Indians’ season is hanging by a thread. Still, two big sources of optimism remain: (1) The Indians bucking the trend by paying for their own stadium renovations, offering hope to those of us who oppose making taxpayers foot the bill for billionaires’ capital improvements, and (2) Corey Kluber, the superstar who came out of nowhere. They’ve got problems. But they’re not out of the hunt yet. 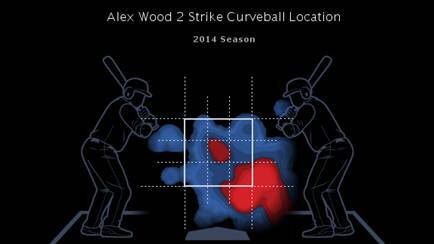 In a sense, Alex Wood’s start against the Nationals on Sunday night marked a breakthrough. The 23-year-old lefty fired a career-high 124 pitches and struck out a career-best 12 batters, pacing the Braves to a badly needed 3-1 win that clinched a series victory against their NL East rivals. But really, Wood’s dominant outing was just a slightly better version of what he’s done all year long.4 In his first full season in the big leagues, Wood has emerged as one of the best young lefties in the NL, posting a 3.08 ERA while registering more than a strikeout an inning. In the process, he has provided a big boost to a Braves team that sorely needed someone to step up following the season-ending injuries to starters Brandon Beachy and Kris Medlen this spring. Wood’s curveball has improved dramatically, as he’s kept it down in the zone more often and lured more hitters to chase the pitch when he throws it out of the zone. Wood is also throwing his curve nearly twice as often with two strikes this season (28.3 percent of the time) as he did last season (15.1 percent). He’s placing it well, too. For more perspective on Wood’s much-improved curveball, check out Buster Olney’s Sunday column, which detailed how a grip change helped lead to this year’s success. Thanks in part to that improved curve, Wood on Sunday powered a Braves team that seemed to have been on the ropes, losing eight in a row heading into the big summit series against the Nats and going from a half-game off the pace in the East to 4.5 games out entering the weekend. They’ve now trimmed a game off that lead, setting up an intriguing race for the final 45 games of the season. But neither catching the Nats nor muscling into position in the wild-card race will be easy. For one thing, the Braves face a tougher schedule down the stretch than any other NL contender. For another, they need to figure out what to do with their fifth starter’s spot, and specifically with Mike Minor. The lefty emerged as one of the best young starters in the league last year, tossing 204.2 innings with a 3.21 ERA and a strikeout-to-walk rate a tick below 4-to-1. Early this year, he seemed destined for another strong showing, delivering a 3.07 ERA through seven starts, capped by a seven-inning gem against the Mariners that included 10 strikeouts and just one run allowed. Since then, he’s been a tire fire, flashing a 7.33 ERA and allowing opponents to hit .357/.403/.584 against him, or roughly what Willie Mays hit in his prime. The Braves skipped Minor’s last turn in the rotation, but they’re planning to start him again Tuesday against the Dodgers. The best the Braves can do at that point is cross their fingers and hope. As solid as Wood, All-Star Julio Teheran, and offseason mega-bargains Ervin Santana and Aaron Harang have been, Minor has been a near-automatic loss whenever he has toed the mound since early June. With that eight-game losing streak taking the shine off their early results, fierce competition for NL East and wild-card supremacy, and that rough schedule, that’s something the Braves can ill afford — no matter how good Wood’s curveball suddenly is. A leaky bullpen has knocked the Tigers from our top tier. Wily Peralta made history Thursday afternoon. Facing the Giants, the 25-year-old right-hander went 6.2 innings, allowing one run on seven hits while walking one and striking out nine. In beating San Francisco 3-1, Peralta picked up the win, pushing him into the major league lead with 14.5 In the process, he became the first Brewers pitcher to become the first MLB player to 14 wins in a season. With a 14-6 record and a 3.42 ERA, Peralta appears to have established himself as one of the NL’s best pitchers — and as someone who has vastly improved since last season’s 11-15, 4.37 ERA campaign. But here’s the thing: Peralta is almost exactly the same pitcher now as he was then. He has just been spectacularly lucky. Using the word “luck” to describe these kinds of surface numbers might seem a little harsh, and Peralta has certainly done some things well, so I’ll address those genuine positives before getting to his good fortune. The biggest change in Peralta’s performance has been in his walk rate. He has walked just 6.7 percent of the batters he’s faced this year, down from 9.1 percent last year; if you’re more used to walks per nine innings, he’s down to 2.55 this year, compared to 3.58 in 2013. The thing is, that’s a relatively minor jump from last year, when Peralta posted a 51 percent ground-ball rate. Glancing at his other numbers, we see a minor uptick in Peralta’s strikeout rate this year, from 16.1 percent to 17.8 percent. All told, we’re talking about a pitcher whose peripheral stats have improved a bit, but nowhere near enough to explain his overall success. To get a better sense of what has driven Peralta’s performance, let’s start with the tremendous run support the Brewers have given their unlikely wins leader. Last season, they averaged 3.41 runs scored during his starts, putting Peralta 35th among 43 qualified NL starters in run support. This year, they’ve scored 4.65 runs per Peralta start, placing him ninth in that category. That’s one excellent way for a good but not elite pitcher to rack up a bunch of wins. Here’s one more stat for you:6 Fielding independent pitching focuses on the basics of a pitcher’s performance, namely strikeouts, walks, home runs, and ground-ball rate. By stripping out the impact of defense, run support, bullpen support, and wide variance in stats like strand rate, FIP can provide a clearer idea of what a pitcher has actually done versus what has happened around him. Well, Peralta posted a 4.30 FIP last year … and has a 4.19 FIP this season. The good news is that Peralta is just one pitcher. The Brewers have spent most of this season in first place because they’ve gotten contributions from up and down the roster, from pitchers and position players alike. And while advanced stats don’t love Milwaukee as much as they love most first-place teams, the Brewers still have a two-game lead in the Central and look like a strong bet to win the division. They just might not be able to lean as heavily as you might think on Peralta to get there. Baseball Tonight researcher Michael Bonzagni contributed research assistance for this column. The Astros have been hamstrung by a terribly messy local TV deal that has limited their revenue streams, but even so, they’ve spent pennies by current MLB standards, with a tiny $26 million Opening Day payroll last year and a $45 million 2014 Opening Day payroll that still ranked near the bottom of the barrel. Felix Hernandez has a 1.96 ERA during that span. Cole Hamels has posted a 1.76 ERA since his first three starts of the season, though with 21 fewer innings pitched than Kluber has managed during his run, and against slightly weaker National League competition. If you want to attribute some of that success to a strong work ethic, I won’t stop you. Not to mention what he’s done against the Nationals. Wood came into Sunday night’s start with a 1.57 ERA and 24 punchouts in 23 innings against Washington, having allowed two runs or fewer in each of his four starts against the Nats. Peralta was in sole possession of the wins lead for a few hours, until Adam Wainwright won his 14th game later that night. OK, fine, one more stat for you: Peralta, who’s basically a two-pitch, fastball-slider pitcher, has allowed a .195 hard-hit average with his fastball in 2014. That’s almost 20 points worse than his result last season.